Shake with ice and strain into a tall glass with ice. Top with 2-3 oz Newburyport Belgian-style Wit Beer. Garnish with a cucumber slice and add a straw. 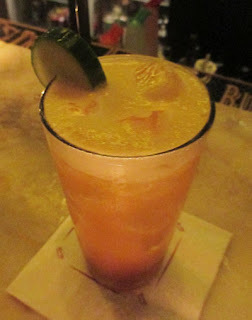 At Eastern Standard, Andrea asked bartender Tom Mahne for the Flip Cup which was their Pimm's Cup variation. Instead of ginger ale or lemon-lime soda, this version called for beer as the carbonation akin to the Somerville Cup. Their beer choice was a Belgian white; while the menu said Blanche de Bruxelles, we were definitely not disappointed when local Newburyport's Plum Island wit beer was used in its place. Once mixed, it offered a cucumber and malty aroma. Next, the sip offered lemon, berry, and malt, and the swallow shared tart and sour lemon grain notes from the beer. Overall, the sourness of the beer worked well with the citrus component in the drink like it did in the Prison Nickname.